Here, the name Button1 is assigned to pin 14. 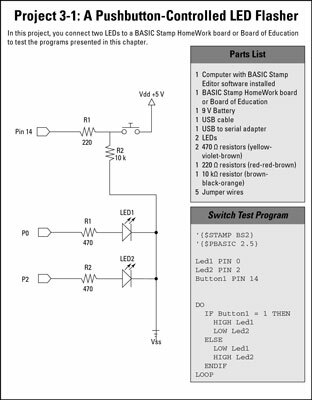 Here, the output pin designated as Led1 is made HIGH when the button is pressed. Here, Led1 is made HIGH if the button is pressed and LOW if the button isn’t pressed. 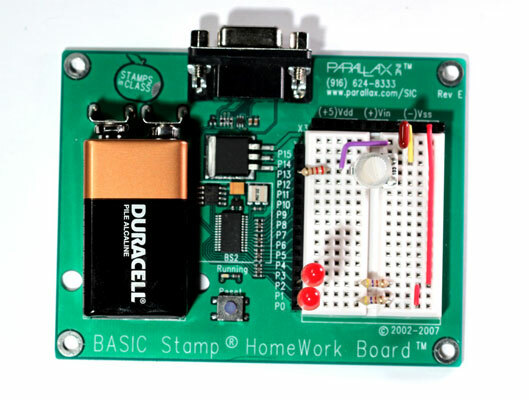 Here is an interesting program that works with a BASIC Stamp that has a pushbutton switch connected to pin 14 and LEDs connected to pins 0 and 2. 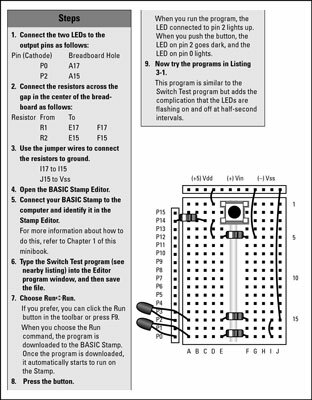 The program flashes the LED connected to pin 2 on and off at half-second intervals until the pushbutton switch is depressed. Then, it flashes the LED on pin 0.